Core to your business is the need to plan and monitor time and budgets across all your projects. With eTrack you can prepare a proposal or job costing and use the same screen to monitor key performance indicators of margins, profit, time variations, $ variations and unbilled work. In one click you can see a very fast roll up of these KPIs across all projects so you can quickly see if slippages in time or money are occurring. 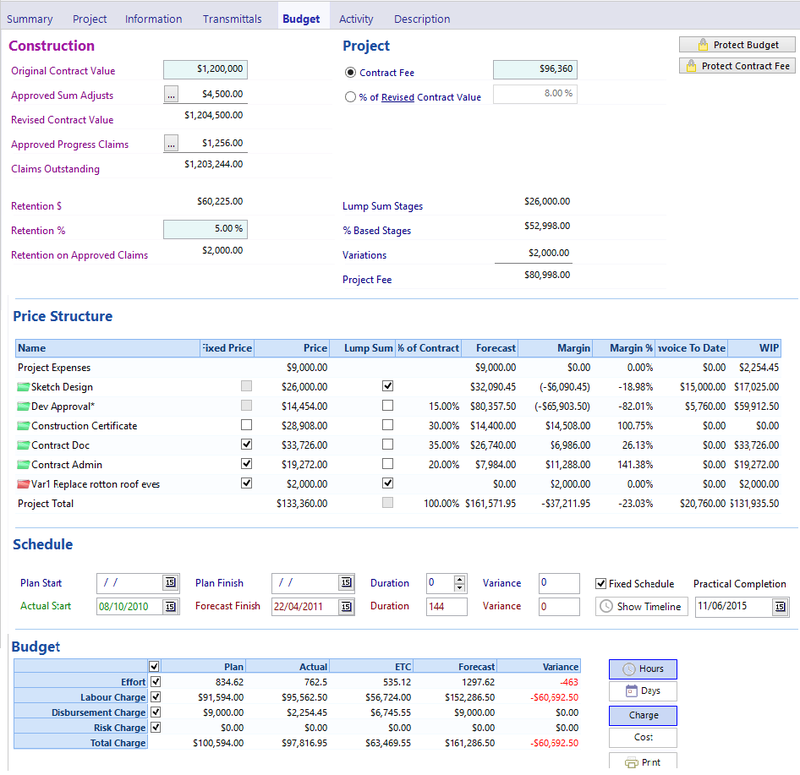 Interactively perform Job Costing by editing resource time, contract percentages, and drawing/material estimates to achieve the margin and profits desired. Use all rate types: Fixed Price, Time based, % Based, Lump Sum… and combinations of these within a project. Setup Rate Tables for different projects, or parts of a project. Define Staff rates or Role rates or a mixture. 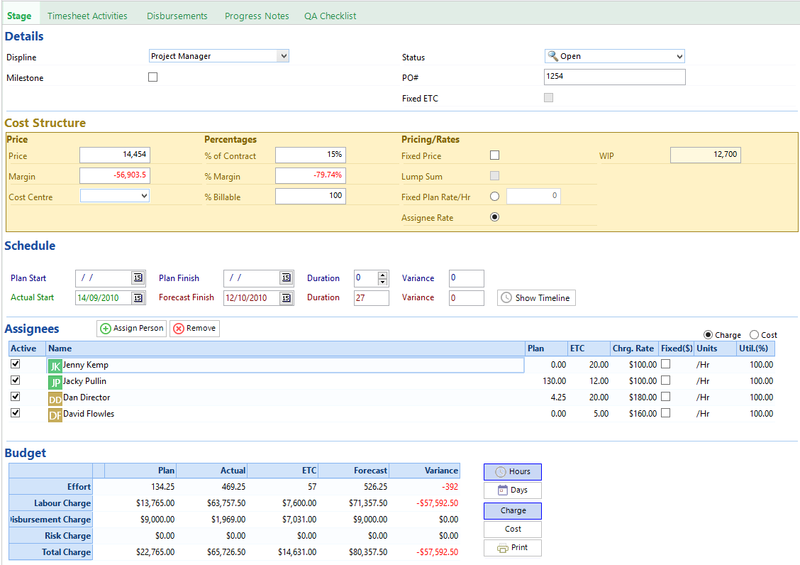 Assign multiple staff and/or roles, estimate hours and define rates. Monitor Key Performance Indicators on one screen: Margin $, Margin %, Variations of time, Charge $ and Cost $ and Unbilled Work (WIP). The first step of a job costing process may be to enter an estimate of the Building Contract Value and the percentage your company plans to receive. This can be broken down into a percentage for each Stage based on previous experience. Some Stages may be excluded from this percentage breakdown by ticking the ‘Lump Sum’ checkbox. This will give you a first pass price to compare with a resource estimate as shown in the Price Structure table below. A simple checkbox determines whether work is Fixed Price or Time based. The next step is to do a resource based estimate to compare with the price. Employees, or roles if you prefer, are assigned to each Stage with an estimate of the hours required for each. Different Rate Sets can be selected for a project depending on building type, client or location for example. Both Charge Rates and Cost Rates are tracked. Charge Rates are used for billing time based work, or comparing with a Fixed Price. Cost Rates are typically salary plus a margin and used to monitor raw profit. In the screen shown below you can adjust the time and the price until the margin is correct. These changes are rolled up to the screen above. Adjusting the estimated hours for each resource can also be done graphically in the Scheduler with the same effect. The third step may be to plan for any Disbursements that are not capped or included in the Fixed Prices or Rates. These are shown as a row in the Budget table for the Stage or Variation and rolled up to the Project. Charge and Costs can be separately tracked. 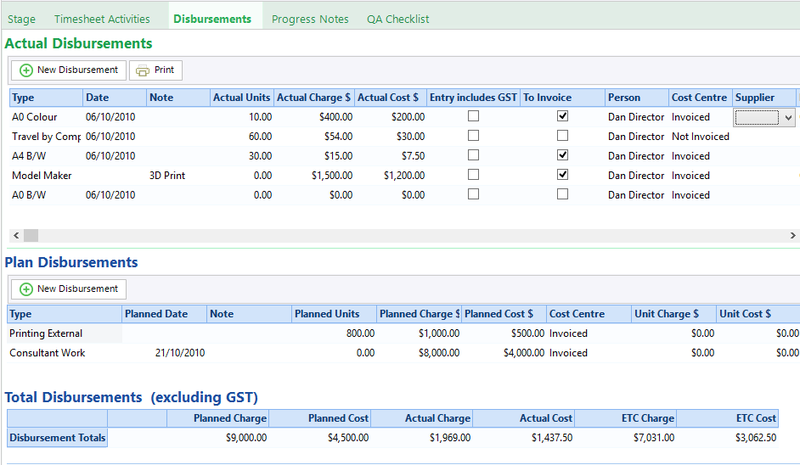 Actual Disbursements can be added in the Timesheet tab and viewed against both the Stage (for invoicing) and the Employee (for re-imbursement). To further cross check that the percentage and resource based estimates are accurate, you could estimate the time to complete QA Tasks for each stage as shown in the picture below. QA Tasks are typically created from a template that is a knowledge base of your methodology. They provide both a guide for staff and a checklist of what has been done. A forth check might be to list the drawings required and also compare this estimate. All the above can be done inside the Schedule allowing resource estimates to be graphically defined while viewing at the same time whether staff are available. By combining all the above, eTrack becomes a powerful, easy to use tool for Job Costing and preparing proposals.